Diamonds are among the hardest natural minerals on Earth, yet they require special care to keep them shining and looking their absolute best. In fact, a diamond’s sparkle can be lost by the mere touch of a finger, which can cause dirt to collect on the diamond. The best way to keep your diamond looking its best: clean your diamond regularly. A simple plan to keep your diamond jewelry looking beautiful is to soak each diamond in an ammonia-based household cleaner (such as window cleaner) overnight, once a week. The next morning, remove the diamond from the cleaner and brush it with a soft, clean toothbrush (a new brush reserved exclusively for cleaning your diamond) to remove any leftover dirt. Take extra care to brush the back of the diamond, because this area tends to collect a lot of oil and dirt. 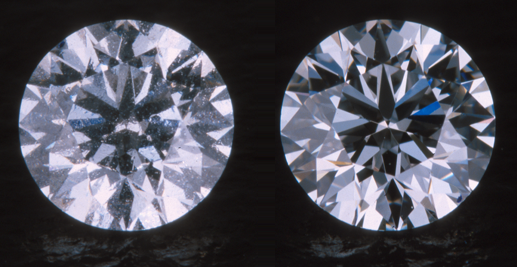 Notice the change in appearance between a diamond when it has oils on its surface from being handled by fingers (left) and a clean diamond (right). Not all gemstones are as hard as diamonds, and some can easily be scratched with a toothbrush. Be sure to check the best method for cleaning your particular gemstone. Fragile settings and older estate jewelry may not respond well to the scrubbing of a toothbrush, so use a soft touch. You’ll want to find a safe place to clean your diamond. If it can be avoided, do not clean your jewelry in or near the sink. If a sink is the only option for cleaning your jewelry, be sure to cover the sink drain so that you can protect your jewelry from going down the drain. Also, use a rubber sink mat when possible to prevent jewelry from breaking or chipping if dropped. Finally, avoid harmful solutions. Chlorine (as in household bleach) or abrasives (such as household cleansers or toothpaste) should never be used when cleaning diamonds, especially those set in jewelry. 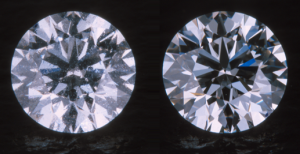 These types of products can erode some of the metals often used in diamond settings, and they may loosen prongs or even dissolve the metal completely. Keeping your diamond clean is a good step in protecting your diamond. While a home method is perfectly acceptable, you should consider having your diamond cleaned periodically by a professionally trained jeweler. Your jeweler can use one of two more thorough options for cleaning your diamond: a steam cleaner or an ultrasonic cleaner. An ultrasonic cleaner sends high-frequency sound waves through a liquid solution to remove the dirt and build-up, and a steam cleaner will use high-pressure steam to remove dirt and build-up.